Guide Lites are individual activities from approved NASA eClips™ Educator Guides that are well-suited for informal settings. Each Guide Lite includes the lesson objectives and a list of materials, which are inexpensive and readily available. Lessons are organized using an Engage, Explain and Extend section. 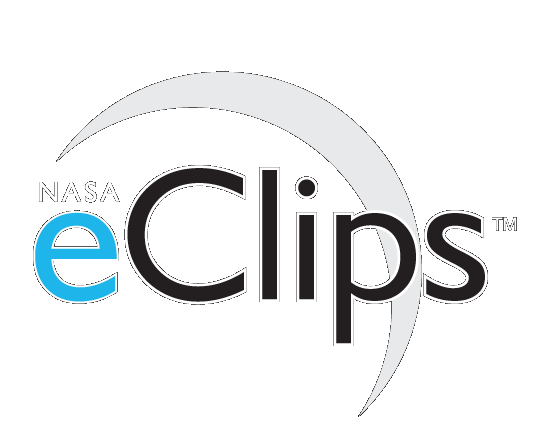 NASA eClips video segments that support each activity are identified in the lesson. In this interactive lesson, students will be able to explain the difference between a physical change and a chemical change, as a result of watching the Spotlite video, learning the vocabulary collaboratively, and discussing the differences between physical and chemical change. Interactive Lesson: In this activity participants will create a picture of the sun that can then be examined with colored filters to simulate how specialized instruments enable scientists to capture images and view different features of the sun. In this activity participants will use sports balls as scale models of Earth and the moon and use string to demonstrate the mathematical relationship between the size of Earth and the moon and the distance between the two. In this activity participants use colored filters to learn more about the electromagnetic spectrum to understand how the new camera on the Hubble Space Telescope helps scientist explore the universe. In this activity participants learn about light refraction and birefringence by viewing sculptures of transparent tape through polarized film. Nondestructive Evaluation (NDE) is the process of evaluating materials to detect and measure the presence of defects without causing damage to the material being tested. In this lesson, middle and high school students are introduced to NDE, refraction of light, and birefringence. Students test a variety of transparent plastics using polarizing filters and analyze the extent and degree of stress the materials have undergone by examining the birefringence produced. Objective: To understand how a satellite in space can accurately measure Earth's surface. In this interactive lesson, students will explain how a star's color indicates its surface temperature as a result of watching the NASA Spotlite video, learning the vocabulary collaboratively, and discussing a star's size and the position in its lifespan.